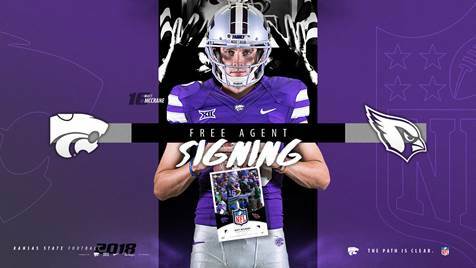 MANHATTAN, Kan. – Former Kansas State place kicker Matthew McCrane will have a chance to prove himself in the NFL as he has agreed to contract terms as an undrafted free agent with the Arizona Cardinals, the organization has announced. McCrane joins cornerback D.J. Reed, who extended K-State’s Big 12-leading NFL Draft streak to 25 years after being selected in the fifth round by the San Francisco 49ers. Other Wildcats could sign undrafted free agent contracts with NFL teams, and those will be announced when they become official. McCrane is the first Wildcat to join the Cardinals since running back/kick returner William Powell was with the organization in 2012 and 2013, while he is the first Wildcat place kicker to enter the NFL since Joe Rheem went to training camp with the Buffalo Bills in 2005. A product of Brownwood, Texas, McCrane was the first three-time All-Big 12 place kicker in school history in addition to being a Lou Groza Award semifinalist as a senior in 2017 and a Freshman All-American in 2014. McCrane left as the school’s all-time leader in career field goals made (57), passing Martin Gramatica, while he also set the school record for career field goal percentage (86.4), a mark that was second in school history and sixth in NCAA history at the time of his departure. McCrane also showed a propensity for connecting from deep as he tied the school record with five 50-yard field goals made during his career, including a record-tying three during his senior season. His 21 field goals made in 2017 ranked third in school history – one shy of the school record – while his 111 points scored ranked eighth in school history and third among kickers.